Chestnut Hill, Mass. - Former Boston College standout Chris Snee, who played at the Heights from 2001-03, was named as one of the 14 members of the Atlantic Coast Conference Football 2014 Class of Legends, the league announced Thursday. The Legends are each selected by their respective schools and will be honored during this year's Dr. Pepper ACC Football Championship Game weekend. They will be honored at the ACC Night of Legends sponsored by the Belk Bowl on Friday, Dec. 5, and on Saturday Dec. 6, during ceremonies at Bank of America Stadium for the 10th Annual Dr. Pepper ACC Football Championship, which will be nationally televised with either a 7:45 pm (ESPN) or 8 p.m. (ABC) kickoff. The group of 14 former gridiron standouts from current ACC schools includes a former ACC Football Player of the Year; an ACC Defensive Player of the Year, 12 former All-Americas, including 10 first-team and six consensus All-American honorees and 12 players who combined for 118 years in the National Football League. Twelve of the Legends were drafted into the NFL, including nine first- or-second-round draft choices. In all, the collection of players combined for three national championships, eight ACC championships, 11 Super Bowl appearances, eight Super Bowl championships and 26 Pro Bowl appearances. Three of the Legends were named to their respective NFL All-Decade teams. Snee, who was one of the most effective offensive lineman in BC history, earned second-team All-American honors and first-team All-Big East accolades as a guard for the Eagles in 2003. A native of Montrose, Pa., Snee helped pave the way for BC's Derrick Knight to finish fourth nationally in rushing with 1,721 yards. In his three years as a starter for BC and head coach Tom O'Brien, he helped lead the Eagles to a 25-13 record, including bowl wins over Georgia, Toledo and Colorado State. An early-entry into the 2004 NFL Draft, Snee was selected in the second round as the 34th overall pick by the New York Giants. 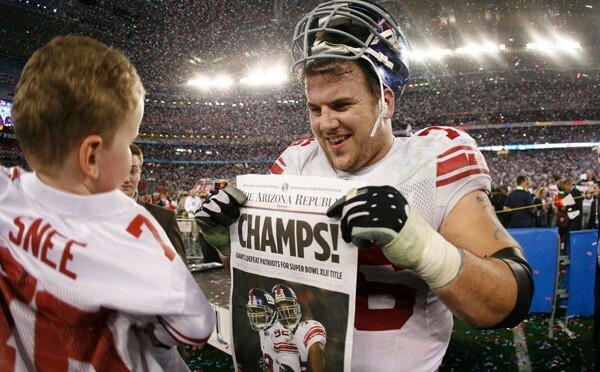 Snee enjoyed a 10-year NFL career with the Giants, starting in 141 games, four times earning selection to the NFL Pro Bowl (2008, 2009, 2010, 2012) and three times being named an All-Pro (2008, 2009, 2010). He helped lead the Giants, under coach Tom Coughlin, to a pair of Super Bowl triumphs in Super Bowl XLII (2007) and Super Bowl XLVI (2011). Snee and his wife, the former Katie Coughlin, the daughter of the Giants' head coach, now reside in Franklin Lakes, N.J.